When some of you read that title you may have thought I’d be talking about a book, How to Cook a Wolf , the famous book by renowned food writer MFK Fisher. And in a way, I was but not directly. Ethan Stowell, chef/owner of Union and Tavolato opened a third location late last year and named it How to Cook a Wolf. For those in the culinary world this novel is one that defines and inspires but it still seems an odd name for a restaurant. I’m sure over time it will come to known just as "Wolf". Odd name or not, the tiny space is cozy and welcoming with big stone structures (the bar and the divider wall between bar and kitchen), undulating wood walls and large windows. There is only seating for about 35 people, including the ten seats at the bar, and this place has been packed since it opened. Since they do not take reservations it’s a bit of a gamble when or if you’ll be able to find a seat. M and I arrived at 6:00 – I was actually there at 5:45 – and were able to grab the two last chairs at the bar. We were seated near the hostess and after that the folks that came in, especially those hoping for a table, were told it would be a 90 minute wait. I actually thought that the hostess was a bit rough with people (trying to come in and spend their money!) and seemed frustrated when people asked any sort of clarifying question. I’m sure it’s challenging seating people in the tiny and popular place but it really seemed she could have been a bit more pleasant in her dealings with the potential customers. 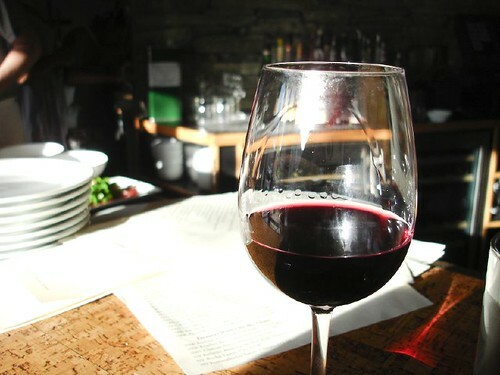 The good news is that they will take your name and cell phone number so that you can wander over to somewhere like The Paragon or one of the three nearby coffee shops to relax or stroll Queen Anne Avenue to make sure you are ready for the meal to come. 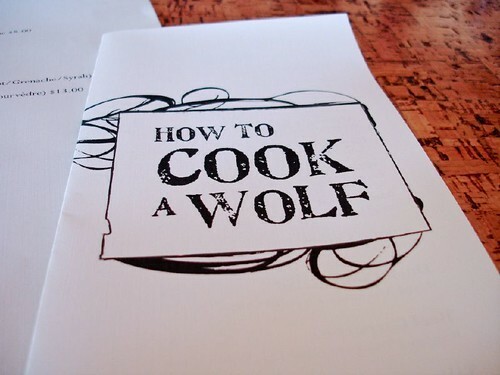 How to Cook a Wolf has an Italian influenced menu but it’s different than Tavolata’s. The bulk of the menu is devoted to appetizers (my kind of place!) and includes four pasta options. There are also half a dozen cheese and dessert options to finish your meal. Sitting at the bar, watching the food come out of the kitchen we had a chance to see many of the menu itmes before ordering. We decided to start with Tombo Crudo which, we were told, was Hawaiian albacore, although that is not the translation I get when I look it up. No matter. While waiting for our Tombo we were served the Asparagus Salad, as the chef had made one extra and we were in the right place at the right time! The asparagus were cold, crispy and very lightly dressed. They sat on a layer of thinly sliced bressola and were sprinkled with large, lightly pickled wild capers. Such a fresh presentation! Although we hadn’t ordered it we were really glad we had this dish. Our Tombo Crudo arrived soon after. So impeccably fresh! 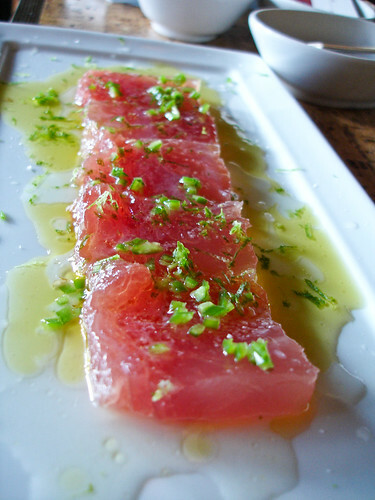 Beautiful squares of the albacore with a hint of hot chili and lime juice. It seemed more Mexican to me than Italian but I’m not going to argue that small point. It was a beautiful dish and I really loved the flavor combination. 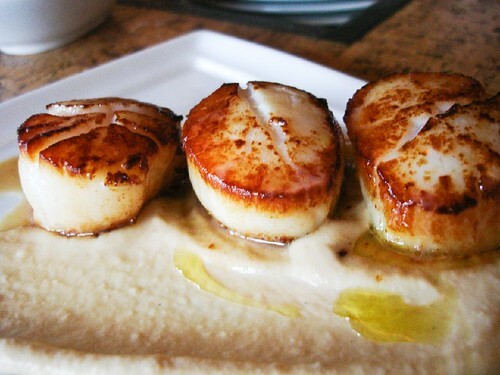 We finally made up our minds about what other items to try – the menu is challenging as it all looks so good – and next to arrive were the perfectly grilled scallops on a white bean and porcini puree. I love scallops and I’m very picky about their preparation. These were really lovely. Grilled until slightly caramelized on the outside yet tender and tasting of the sea on the inside. The puree had a slightly different texture, a feel of creaminess, and an earthiness from the mushrooms yet didn’t take away from the essence of the scallop. Next, and I know this sounds like a lot but portions are small and we were sharing, our bowl of spaghetti arrived. Flavored with garlic, chilies and anchovy and topped with olive oil and a mound of grated Parmesan it was simple and satisfying. When we’d first ordered we thought we might have to take some of it home with us but there wasn’t a speck left when we were done. M decided to order an espresso to finish and I asked for tea. This was my personal disappoint of the night. No tea. Not only no tea but our server was a bit callous about it, recommending I just go to one of the nearby coffee shops in a sort of condescending manner. I don’t know what their reasoning is for not having tea – the espresso machine is certainly equipped to make hot water and a couple boxes of tea bags don’t take up much room – perhaps it’s not Italian enough, but it seems to be a silly decision or oversight. That being said, our server did make an adjustment to our check and I think it was to compensate for the lack of tea, which was nice. We really loved this meal and the whole feel of How to Eat a Wolf. I wish the staff would be a bit more mindful of their attitude and treatment of customers in some ways but I’m willing to excuse it for the time being and to hope that corrects itself or that what we saw with the hostess and my tea request were just oddities. And I did appreciate the adjustment to the check, which makes up for a lot. My recommendation for getting a seat at this already well-loved location is to get there as soon after 5:00 pm as possible; wait until about 7:00 to grab a seat as the first round vacates; or simply plan on stopping by, adding your name to the list and spend a pleasant hour wandering or having a pre-dinner cocktail. Thanks for stopping by and for your kind commnets. Yes, I don\’t get out and about into blog land all that often – or actually I do check in but I tend to read and run. I sort of limit my comments due to time constraints. But I appreciate you checking in!